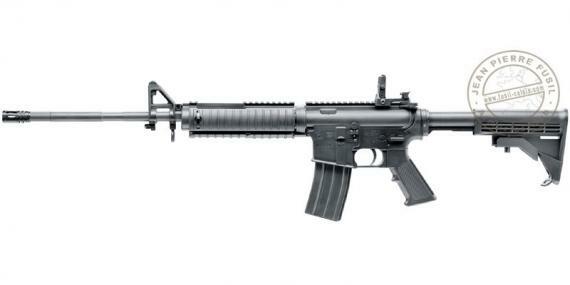 Often imitated, the famous US assault rifle Colt M4 is finally proposed in an "official" air rifle version, under COLT license, with the same logos and marks as the original. Using the design and the main characteristics of the M4, this air rifle made by Umarex has a power of 19.9 Joule, making it accessible to any people over 18 years old. Under the guise of an assault rifle, hides a spring, one shot airgun in .177 rifled bore, perfect for recreational shooting on targets, cans or bottles. Firstly designed for Special Ops, this military carbine was to be maneuverable. It was thus made with a short barrel, and an adjustable stock. With a simple pressure on the stock lock lever, the stock slips along a tube, extending of 5 notches, i.e 8 cm, and can thus be adapted to various shooters. he pistol-type handle is squared, for a better handling, and marked "COLT". The barrel, rifled steel, is ended by a muzzle. It is marked with 5.56 NATO 1/7. The rifle also has 2 swivels, at the end of the stock, and under the front sight, to set a shoulder strap. The fire selector switch hides the manual safety lever. Umarex has also add a removable but dummy magazine, to move closer to reality. It is removed by a pressure on the magazine catch button. Under its military appearance, this air rifle works as a classic one, it is break barrel. The cocking is made pulling the barrel down at most, and getting it back to its initial position. The pellet has to be inserted in the barrel when open. Once the target aimed, remove the safety, and pull the trigger.